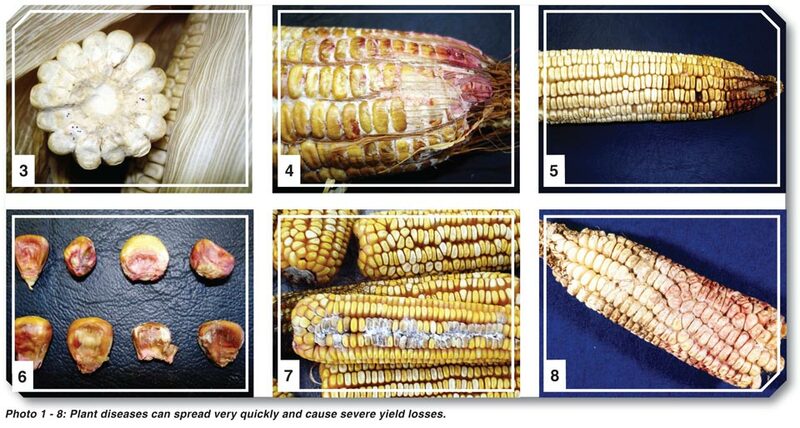 Maize can be very susceptible to many different diseases. We are noticing this more and more as our cultivars and varieties are becoming more advanced. In the past maize cultivars were developed for resilience and resistance where now the biggest focus is on yield and production in our attempt to ensure food security. There are certain cultivars that have been developed to be resistant to certain diseases; this however is no longer the primary focus of modern day genetics. This is not a bad thing; it does however mean that we need to be aware of the different maize diseases and it also means that we should always be on the lookout for their occurrence in our crops. There is always something that we can do to mitigate the damage that they can cause. In the same way that our maize cultivars have been developed for production; our chemicals have also been advanced for the effective control in diseases and pests in our crops. Plant diseases are primarily caused by fungi, bacteria and viruses. They can spread very quickly and can cause terrible damage if you do not put the correct control measures in place. Fungi, bacteria and viruses can affect all the different parts of the plant including the roots, stems, leaves and the cobs. The latter can have the largest affect on yield when it comes to harvesting the crop, the maize grade will also be affected negatively. Diseases in maize require certain environmental conditions to develop. If conditions are favourable and the disease is present in the host plant then it will start to develop and take over the plant. It will consume energy intended for leaf and grain production and ultimately it will suffocate the plant. Once disease is present in a single plant it can be spread to surrounding plants by wind blowing bacterial spores which will settle on leaves and stems and start to take destructive action in the next plant. Bacteria, fungi and viruses which cause disease can remain present in a land for many years, but if environmental conditions are not favourable then they will not develop. A disease which occurs in a specific area in a specific season may be absent in the same area the following season if the conditions are not favourable. Before the planting season starts we need to have a plan of action for disease control. The cost of these control measures is always a big factor. The most cost effective measure for disease management is preventative. Understand the crop you are planting and the diseases which occur in your area. If there is a cultivar available on the market which is resistant to a disease which occurs in your area then it will be wise to plant that cultivar. Include a bacterial and fungal remedy in your chemical spray program which will assist to neutralise much of the existing fungi and bacteria living on the residue in the land. If you practice no-tillage and you are noticing increased occurrence of certain disease then it may be a good idea to do a once off working of the soil. Some diseases are harboured on the stubble or residue on the land and by tilling the soil these can be neutralised. Crop rotation is also good practice as some diseases can only survive on specific host plants. By rotating your crop you can increase the period that a disease needs to survive for before a suitable host is planted again. Plant your crop at the correct time. As the season changes so does the climatic conditions. If you can plant in a time frame when the environmental conditions are not suitable for disease development then it will be most beneficial for your plants. This disease often occurs in humid areas when leaves are exposed to long periods of wetness. The disease is identified by lesions which are small elongated brown-grey spots which grow parallel to the veins. 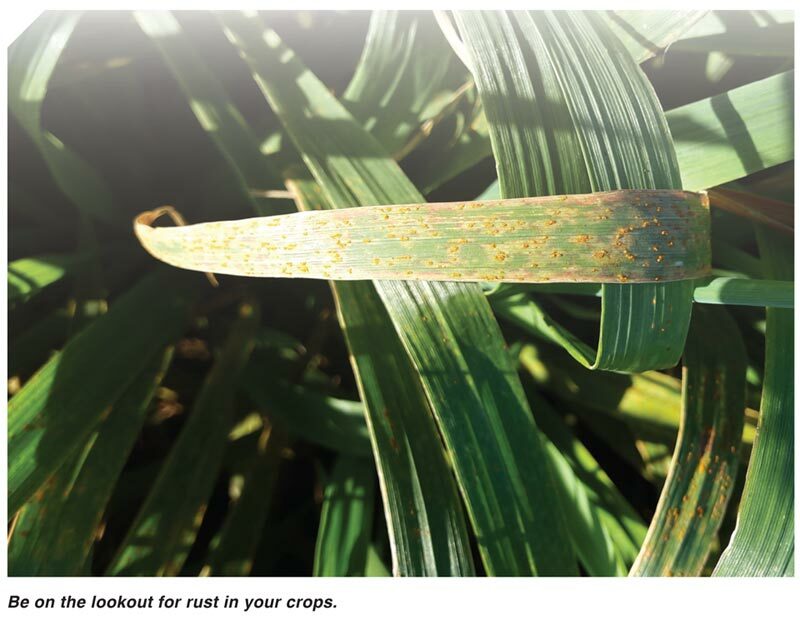 There are reports of increased incidence of grey leaf spot in minimum tillage systems. There are a number of different types of blights. Blight usually occurs first on the lower leaves and increases in number as the plant develops. Blight can lead to complete burning of the foliage. Blight occurs especially in areas where high humidity and moderate temperatures prevail during the growing season. It can lead to significant economic damage. There are various types of rot that cause the rotting of the lower stem and the spaces between the maize kernels. This results in lodging and yield reduction. Most of the rotting diseases occur when the conditions are moist. These diseases produce toxins which are a threat to human and animal health. These are just a few of the many diseases to be on the lookout for. You never know when a disease will appear as environmental conditions are always changing. The key is to always be actively inspecting your crops in order to take action if something occurs. Always keep in mind that the best method of disease control is to take preventative measures before the season starts.